We often receive great suggestions from people who have invented alternative ways to play HexAgony. If you’ve got a variation on HexAgony, drop us an email with the details and if we like it, it will be included on this page. To play the game as it was originally designed, follow the link to the original rules. 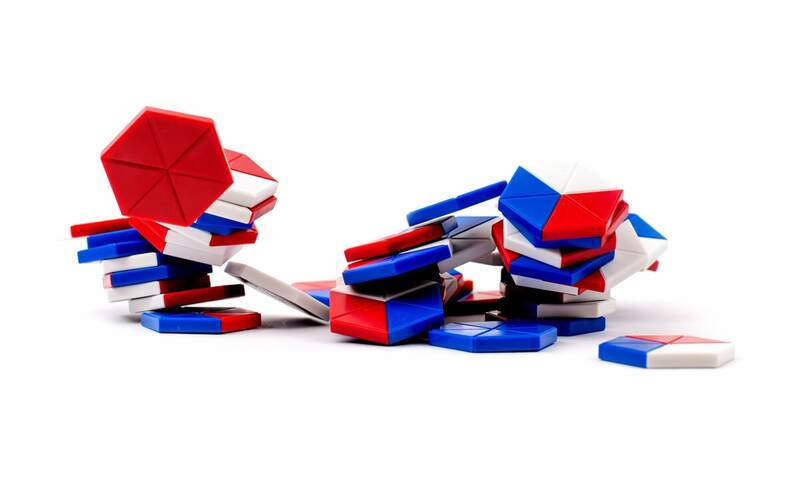 We really love this variation of HexAgony because it’s so simple to play. Like the traditional version of the game, this can be played by 2 – 3 players. At the start of the game players choose a colour, red, white or blue and take the corresponding solid colour tile. The first player picks a random tile from the bag, places it as usual, and then passes the bag to the second player. The second player then draws a random tile from the bag and places it against their chosen colour on a tile already played, and then passes the bag to the next player. If there is no valid move available the player misses their turn, but keeps the tile for their next turn. If a player chooses to play their solid colour tile, they do not select one from the bag. Play continues like this until there are no more tiles in the bag, or until no one else can go. Scoring is the same as the traditional version, with the player with the most completed hexagons being declared the winner. This is for 2 – 3 players who prefer a more tactical game. Playing the game is similar to the “Random” game detailed above, but at the start of the game players draw three tiles each from the bag. On their turn, a player selects one of the three tiles in their hand to play, or alternatively plays their solid colour tile (after the first move). Once a player has placed their tile, they draw a replacement tile from the tile bag, and then pass the bag to the next player. If the player lays their solid colour tile, then they do not draw a replacement tile from the bag. Play continues like this until there are no more tiles to draw, after which players use the tiles in their hand, until all of those tiles have been played. We’re really grateful to Kathleen for inventing this fun game using HexAgony tiles. One player takes five or six tiles and creates a pattern with them. 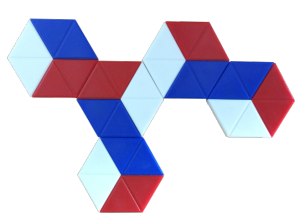 The other players grab tiles and try to recreate the shape as quickly as they can. The first one to copy the shape exactly is the winner. Is there a way that you can play HexAgony with 4 players? Well not until recently, and this new way of playing hasn’t been play-tested, so please give it a go and see if you like it. In addition to your HexAgony tiles, you’ll need a pen and paper to keep score. Download a PDF of the rules here. Remove the 3 solid colour tiles. Place one of the solid tiles on the table to start. Players take 1 tile at a time from the box/bag. Players then play any colour tile on their turn. Points are awarded for every side that touches. Use one of the solid colour tiles to start the game, the other two solid tiles are not required. In the example below, the red tile is placed on the table to start the game. The first player to go places their first tile so that a red segment touches the solid tile, this scores one point, as only one side of the tile being played touches the solid tile. Player two then places a tile that touches in two places, and scores 2 points. As in regular HexAgony, wherever sides touch the colours must match. You cannot have a red side touching a white or blue side. Finally, player three places their tile, it also touches in two places to score two points, but they also make a hexagon, and so are awarded a bonus point. 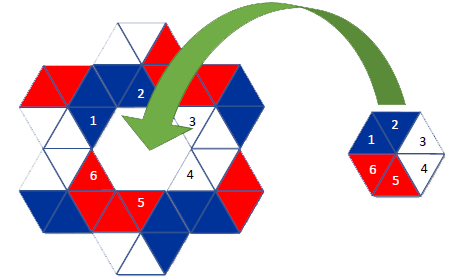 The highest possible score in one move is 9, where all six sides of the tile being played touch existing tiles, and also form 3 hexagons, to get 3 bonus points. 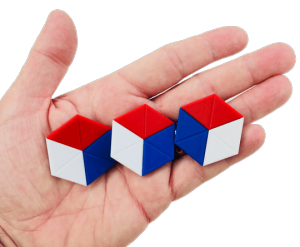 Yet another version of HexAgony was “invented” at the London Film and Comic Con by our friends at a certain UK Games distributor, and it’s truly Evil ! At the start of the game ALL of the tiles (Including the solid colour tiles) are placed in a bag, and players select the colour they want to be. 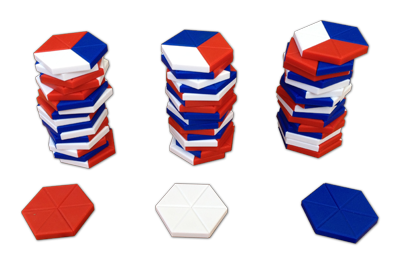 When it’s their turn, players select a tile at random from the bag, as in the classic version of HexAgony. 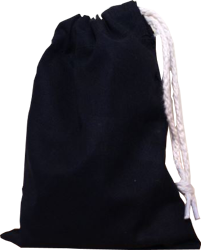 If a player picks their “own” solid colour tile form the bag they will endeavour to play it to their advantage, but if they pick the solid colour tile of their opponent they can play it to their opponents disadvantage. Randomly separate the counters into 3 even piles and place a solid colour counter in front of each pile. The third counter is taken from the 3rd column, and played against blue. Play continues in this manner until no more tiles are left in the bag. Add up the total number of hexagons you’ve made (subtracting any made of other colours). A good score would be 10 or 11 hexagons, with 8 being pretty average. Give it a try and see how many you can make. The real agony comes the next morning! We do like the sound of this variation and must admit to having tried it on a number of occasions. All you need for the game is a set of HexAgony tiles and some shot glasses, plus whatever tipple takes your fancy. The rules are the same as regular HexAgony except every time you create a hexagon your opponent(s) have to down a shot. If you’re lucky enough to create the elusive triple hexagon around the solid colour, then they get to down two. Simple ! 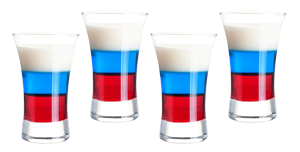 Please remember to drink responsibly, as it could seriously impair your ability to play HexAgony !